Gone Fishing Guide Service. Upper Delaware River fishing. 2012 marks my 18th season! The Upper Delaware River system has one of the finest wild trout fisheries in the United States. The main stem of the Delaware begins in Hancock, New York and runs south - has a wild strain of rainbow trout which dates back to the days of the Erie railroad at the turn of the century. These hard fighting rainbows can be found in the riffles and at the heads of the eddys. The Upper Delaware River system has an abundance of caddis, mayflies and stoneflies which hatch from late April through September. Early in the season when the water may be high and off color, spin fishermen using spoons or heavy spinners will have their day. The best time to target trout will be from late April through early July and again from September through November. Would you like to see more portfolios? 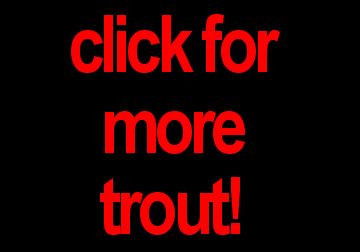 Click here for Walleye or Bass! Clients with their wild trout! References are always available.